Here's the group .. but wait! Who are they?? Later on Sunday, Debbie set up the Super Quilter home quilting system so the rest of us could see what it was like and how it worked. It's one of the several small quilting systems that simulates what long-arm quilters can do, but with the home sewing machines that the rest of us have. 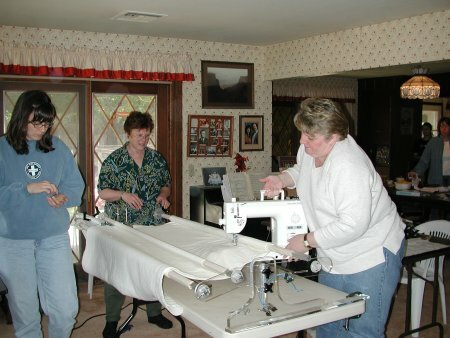 Debbie uses a Brother PQ-1500 with the Super Quilter, making for a very fast quilting job. Susan was helping with the set-up; Pigley was snorting truffles and morels. On Sunday, Debbie brought with her an incredible wealth of show-n-tell quilts. Debbie tends towards traditional patterns, done in scrappy fabrics. Her technique is exquisite and color sense is awesome. 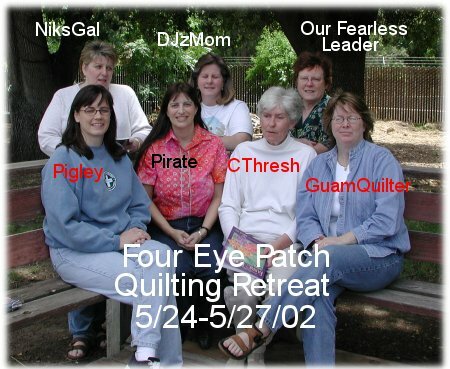 Click here for a new window that will display the 7 quilts Debbie showed to us. And here is a new window of the 2 applique WIPs that Debbie is working on.